There are a few documents that are very important for any citizen of India. All of these documents function as proofs of various kinds and have to be produced before different government bodies and officials to accomplish various processes. Out of all the documents in the arsenal of the Indian citizen, the PAN card is one of the most essential. What is a PAN card? Permanent account number card or PAN card gives the citizen a personal account of his/her that is linked to various other documents. Also no citizen of India can avail of a bank account without first procuring a PAN card. The Pan card is absolutely necessary for anybody who wants to open a bank account. It functions as a proof of citizenship and a proof of residence also at times. You can apply for a permanent account number card online or directly through the PAN card office. 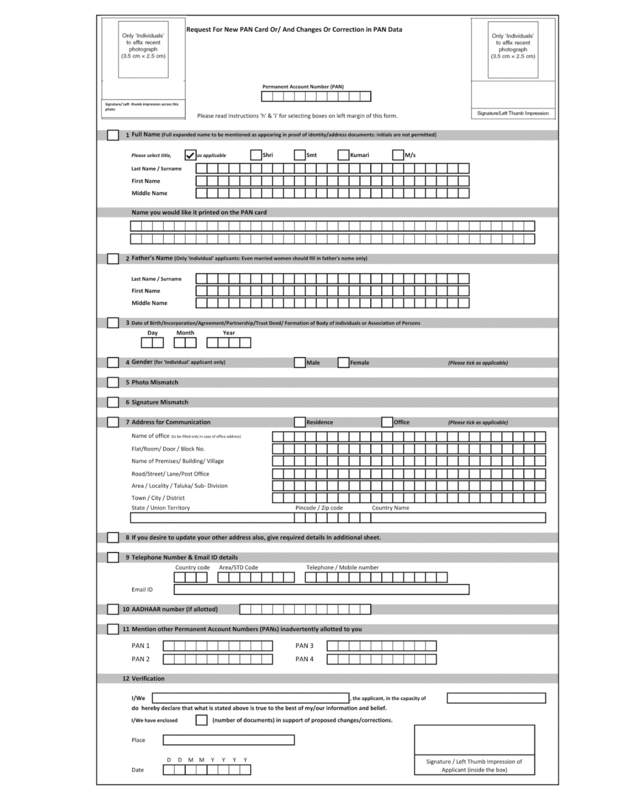 The process requires you to fill out a form with your basic details and information. Please make sure to double check all of the information that you provide. After your details have been verified and processed, you will be asked to send in all the supporting documents for the purpose of verification. This is a very crucial part of the process as it will determine whether your application is worthy of being passed ahead. After all of this is complete you will be given a go ahead depending on whether your application passes the test or verification process. The PAN card will arrive at the address that you have submitted along with your form. It will arrive by post. The completion of the verification process takes anywhere between 5 to 15 days; it depends on whether you have applied online or directly through the PAN card office. You will have to submit certain documents as proof along with this correction form also. Please double check all of the information that you have submitted along with this form. PAN card is one official document every citizen of India must have. It is better to apply for one as soon as you turn 18. PAN cards have a number of uses the main one being the ability to pay taxes and keeping your papers clear. So if you haven’t applied for one, go ahead and do it today!